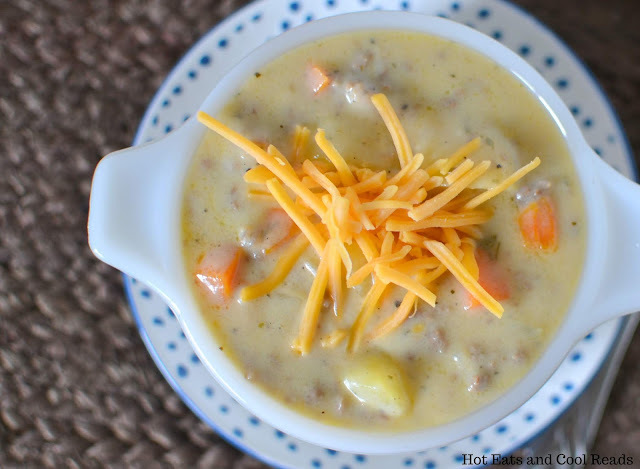 Let your crockpot do all the work for you with this cheesy, hearty and delicious soup! Great for lunch or dinner and freeze the leftovers for another day. Like temps as low as 30 degrees and turning on your heat kind of fall. Brrr. 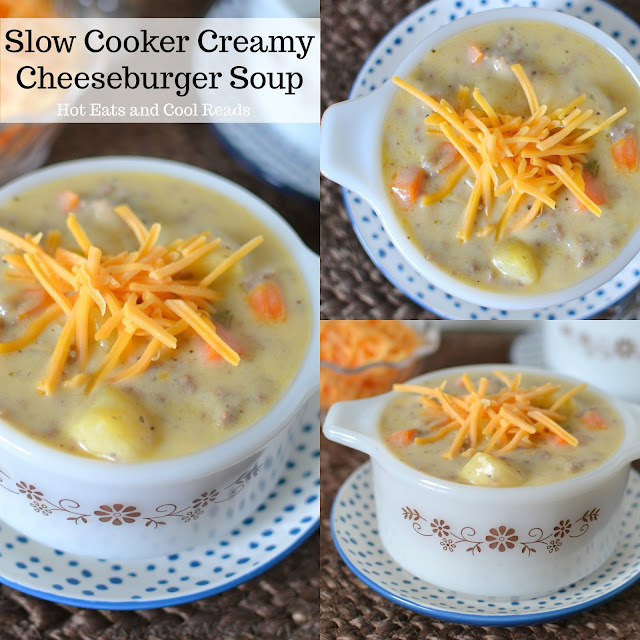 This weather is what inspired today's recipe for Creamy Cheeseburger Soup. I needed something to warm me up and soup always does the trick! Soup has always been a favorite of mine. 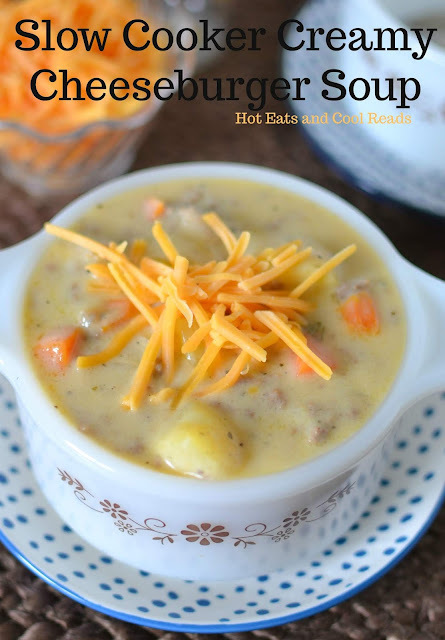 In fact, there are over 50 soup recipes here on the blog!!! I remember big batches of beefy noodle soup on the stove at home, made by my dad, along with a simple batch of Lipton Extra Noodle Soup with crackers for lunch during Christmas vacation. My love for soup has carried over into adulthood and now my love of soup has defintely been passed on to my daughter. 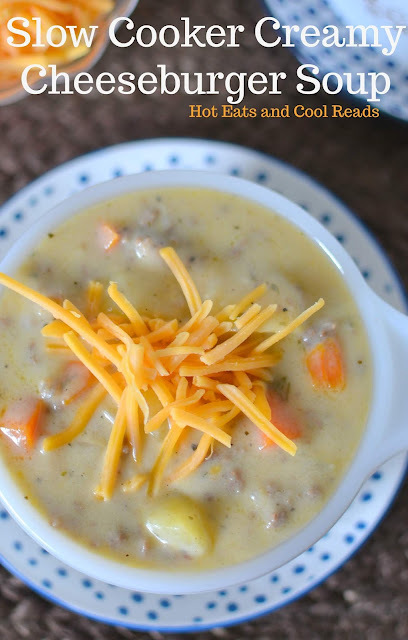 This delicious and creamy soup turned out perfectly! 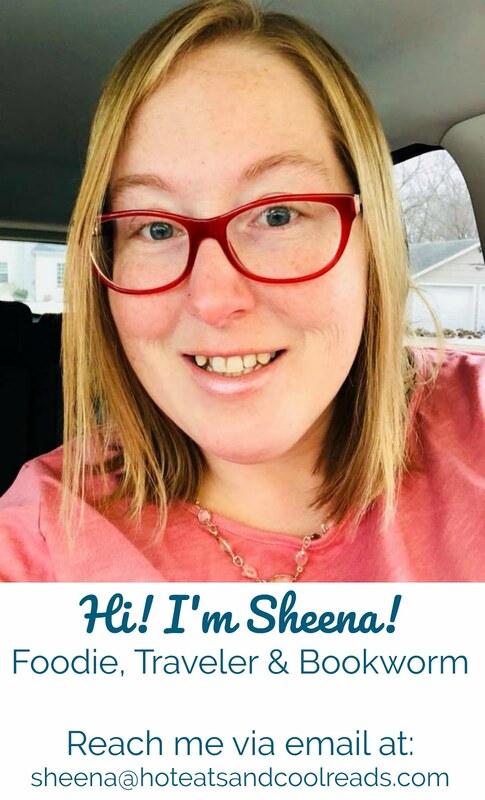 I had all the ingredients in my fridge and pantry, making it so easy to prepare! No trip to the grocery store for me this time. We tend to always have velveeta in the fridge. Don't judge. Another childhood favorite was "Cheese Spaghetti." Basically macaroni noodles, milk, velveeta, salt and pepper. Our version of mac and cheese. My daughter asks for it on a regular basis as a side to some shrimp, chicken or beef, so we always have it! Velveeta is why this soup is so silky and creamy. It adds a great texture and flavor! We only ate a few bowls of this soup, so we defintely had leftovers, which is great! 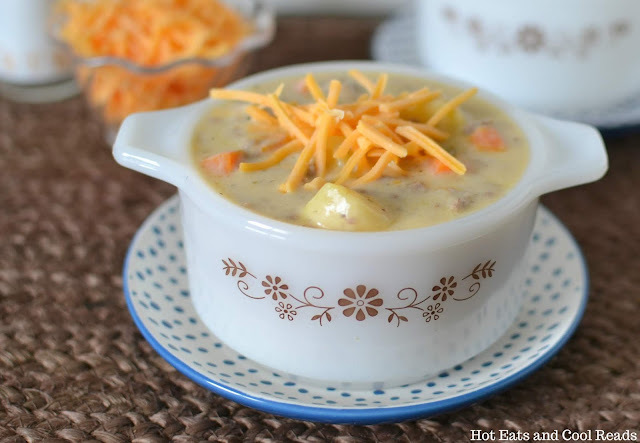 This soup is perfect re-heated for lunch or freeze in single size portions for another time. Try sprinkling cooked and crumbled bacon on top along with the cheese for a bacon cheeseburger soup! Or sprinkle some chopped green onions on top for some fresh flavor. There are so many easy touches that can change up the flavor with each bowl! Place potatoes, onion, carrots, garlic, basil and parsley in a large slow cooker. Pour chicken broth over top. Cover and cook on high for 3-4 hours, or low for 5-6 hours. Add the ground beef 30 minutes prior to serving. Then, melt butter in a large skillet. When butter is melted, add the flour, whisk often and cook for about one minute until bubbly. Whisk in the milk, salt and pepper and pour into the slow cooker, stir. Add the velveeta cheese, stir again, then cook for another 20 minutes, until cheese is melted. Serve with shredded cheddar on top and crackers on the side.